The last month of the year is finally here, and it's time to #TackleYourTBR! We teamed up with Ana from Ana Loves to bring you guys an awesome and engaging challenge that will make finishing out the year with a bang super fun! #TackleYourTBR is a month long challenge dedicated to readers and bloggers. The goal is to complete any challenges or goals you set up at the beginning of the year before 2015 ends. Just some examples of this include your towering ARC/TBR stacks or your Goodreads 2015 Reading Challenges! If you've participated in ARC August before, think of this challenge like that - but instead of challenging yourself to finish your ARCs, you're just challenging yourself to finish any challenges you signed up for throughout the year that still need to be completed! 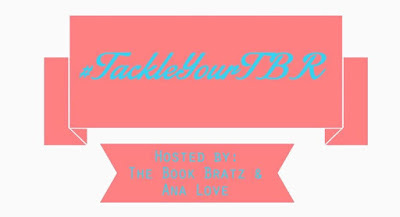 By participating, all you have to do is complete your challenges and share your successes and struggles on Twitter & Instagram with #TackleYourTBR and, if you’re a blogger, post weekly on your blog. We'll be doing the same so everyone will be having lots of fun! For those of you who want an extra challenge, starting today we will post challenges and topics of the weeks for every week of December for you to somehow to incorporate in your reading or blogging for that week! The challenge spans the entire month of December and we will all be cheering one another along to finish our reading and blogging goals (along with Ana! ), so it's going to be loads of fun. Although #TackleYourTBR is dedicated to just finishing up any challenges you set at the beginning of the year we are providing you with two more opportunities to challenge yourself! The first challenge is geared towards bloggers (although bookstagrams and bookish-Twitters are welcome to join in as well), in this challenge we provide a topic that you can talk about as you do your weekly update or if you just need some inspiration to post that week. It makes finishing out your challenges super fun! The second challenge is created for participants who have bookstagrams and bookish-Twitters (once again, everyone is welcome to join). In this challenge you have to find a way to incorporate that week’s theme into your reading, picture or caption. For example, Week 4’s theme is Ugly Holiday Sweater so you can take a picture of your book with an ugly holiday sweater OR you can find a book that reminds you of a holiday sweater (ugly on the outside but warm and cozy on the inside). So it's time to crack down and get started on finishing off those reading challenges! On Sunday's upcoming post we're going to talk about the challenges we're vowing to finish out, and we encourage you all to do the same! Let's have an awesome month filled with a lot of success and good times, everyone!